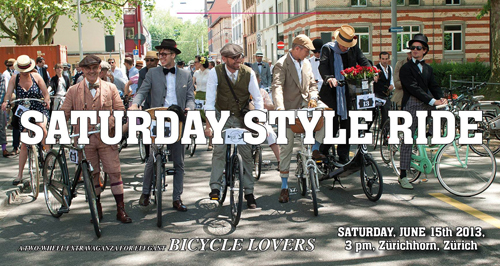 Today at 3pm, the legendary Saturday Style Ride – “a two-wheel extravaganza for elegant bicyle lovers” – will be the main attraction on Zurich’s streets. It’s not about speed, but more about style and taking the time and biking with other people alike. Meeting- and starting-point is at Tinguelys Heureka sculptre at Zürichhorn. So – get your bikes from the cellar and your most elegant and stylish clothes out of the wardrobe and be part of it. Or watch out for them later this afternoon. Further details and the speficic route, you’ll find on their website. For lovers of: fashion, cycling and live.